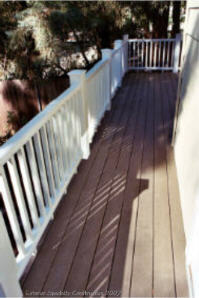 How to Build Wood decks and patio covers to Last. There are many things I do to exterior projects to make them last that I have learned through experience. Most of these are general concepts that apply to whatever I build. I build the structure and as much as I can of pressure treated wood and this structure may additionally be water sealed. I treat all the cut ends with a nasty sealer, or whatever the other sides are treated with. When I build a deck of redwood, I water seal all six sides of each piece of wood before it is installed, usually with Cabot Premium deck sealers. If I am building a painted structure, such as a railing, I seal the major connections with a nasty wood preservative and then prime all six sides of each piece of lumber before it is installed with an exterior oil based Primer, and then paint the whole structure. Some pieces will additionally be painted on all six sides before they are installed. Footings are always raised above the ground and are sloped so that soil, and thus moisture does not meet the wood. Caulking is done on the top of a connection, but not on the bottom, so water does not collect and can run out if it does get in. On top of joists, between the decking boards, flashing or pipe wrap tape can be applied to keep moisture away from this connection. Major beams can be flashed with metal, rolled roofing strips or asphalt emulsion. Many contractors don't do these things because it is time consuming, messy or they just don't know any better. The finished product may look the same, however in years to come the investment will pay off many times over. Copyright © 2013 ExteriorSpecialtyConstruction.com. All Rights Reserved.